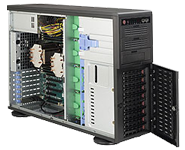 Will Jaya your direct source for supermicro rackmount servers and tower workstation are customized for performance, GPU or Storage. 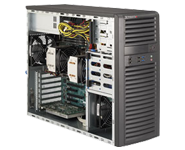 Supermicro SuperWorkstations supporting the new AMD FirePro™ W9100 deliver ultimate performance for professionals working in engineering, graphics, 3DCG and UHD 4K production environments. Scientists and Engineers will appreciate the massive parallel processing power of 2.62 TFLOPS peak double-precision and 5.24 TFLOPS single-precision compute performance per GPU for the most compute-intensive applications. Computer Graphics, Animation and 3D professionals can unleash their creativity with extreme graphics performance enabling real-time manipulation of geometry intensive models at 3.7 billion triangles per second in high frame rates and ultra-high resolution. Broadcast and Cinematic Media professionals are now free to compose on-the-fly in Ultra-High Definition (UHD) 4K resolution. AMD Eyefinity multi-display technology and 6x onboard Mini-DisplayPort 1.2 outputs drive six 4K displays for the most advanced UHD workflows and with 16GB ultra-fast GDDR5 memory onboard, entire datasets of 4K video frames can be buffered in advance of GPU processing for accelerated workflow speed and responsiveness. 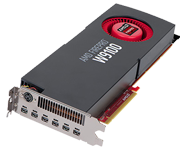 With integrated multi-GPU and OpenCL™ 2.0 support, Supermicro’s new FirePro W9100 enabled SuperWorkstations have the raw, scalable compute power to tackle the most intense research, engineering, design and media projects of this generation. 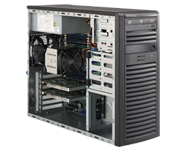 For more information, contact your Will Jaya's account managers to find out more about Supermicro products with FirePro support.